(1593, Delft or Rotterdam-ca. 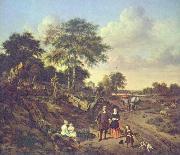 1 November 1641, Enkhuizen) was a Dutch Golden Age painter and engraver of animal, landscape and still-life subjects. He was the father of the still life painter Jan Jansz van de Velde. He was apprenticed to engraver Jacob Matham in 1613, entered the Haarlem guild in 1614, and then probably visited Italy. He is better known for his etching and engraving than for his painting. According to Houbraken, he was the brother of Esaias van de Velde and Willem van de Velde the Elder, but according to John Denison Champlin, Esaias was his cousin, and he was no relation at all to the family of Willem.